Sara Donati/Rosina Lippi is resurrecting her Storytelling blog (kind of) and in honour of the upcoming release of The Endless Forest, the final book in her excellent Wilderness series, she is giving away two signed copies of The Endless Forest. Another author giveaway, this time from Robin Maxwell. The Love Games are heating up! This time, Robin is giving away a lovely heart necklace and a signed copy of O, Juliet. This is the first of three necklaces that are given away, and if you would like a sneak peek of all three prizes, then click here. Do you enjoy reading Christian Historical Fiction? 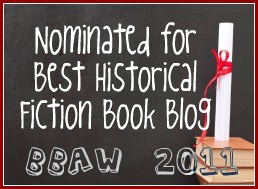 If the answer to that question is yes, then the Christian Historical Fiction Reading Challenge 2010 might be something that you are interested in. You can find out all the details at the challenge blog. The Historical Fiction Round Table is kicking off it's second event, this time with Leslie Carroll, author of Notorious Royal Marriages. It sounds like the ladies have exciting plans for the upcoming year. You can check out their new joint blog here, and here is the schedule for the upcoming event. Over at Savvy Verse and Wit, you can read an interview with Abigail Reynolds, author of Mr Fitzwilliam Darcy: Last Man on Earth. If you live in the US or Canada there is also a chance for you to win a copy of the book. Alyce from At Home with Books is clearing off her bookshelves again in January, and one of the options is Blindspot by Jane Kamensky and Jill Lepore. Allie from Hist-Fic Chick is giving away a signed copy of The Queen's Dollmaker by Christine Trent, a book that has been getting good reviews around blogland. Thanks for letting everyone know about my giveaway!